MicroStation CONNECT Edition delivers new printing and publishing enhancements. The following are just a few, of what I feel, are going to be the most popular. Refer to the “What’s New” documentation for a complete list. By default, when creating plot files using a MicroStation printer driver configuration file, only the name of the file is included when the plot file is generated. There may be a situation where you would like to include the filename extension as well. Let’s say you desire the ability to set all of the Preferences in Print Organizer to the same values for all of your users. You will need a listing of each of the MicroStation Printing variables associated with the Edit>Preferences option in Print Organizer. How can I combine the path to the design file name, date and time file into a single string inside of a MicroStation pen table? By default a MicroStation pen table does not allow you to string variables together but via a named expression you can easily accomplish this. When working with print sets (.PSET) in Print Organizer, the full path to the design file, pen tables, and design scripts are used. Sometimes the files that make up a print set are renamed or moved to another folder. This can cause problems when printing the same .pset at a later date. MicroStation V8i SS3 always processes print styles in the following order. Have you ever plotted a file and notice a single line or lines that extend to the edge of the plot (known as zingers) that are not in the design file? Isolate location of the bad element. Is it in the master file or reference file? 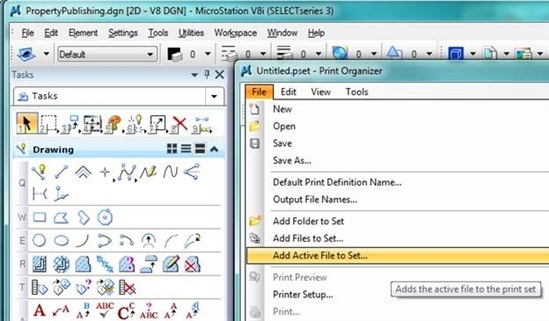 In MicroStation SELECTseries 3 (v08.11.09.292), Print Organizer has a new option to Add Active File to Set. This is a simple way to create a new Print Set that might allow you a quick way to test a “work-in-progress” Print Style or for simply creating a quick Print/Preview of a new sheet model to make sure everything looks the way you want it. With the increased need for Portable Document Format files (PDFs), users may look for ways to enhance the quality of these documents. With MicroStation V8i, the ability to produce top quality PDFs is available. You can now publish non-graphical business items to a 3D PDF document. These business items appear as objects in Adobe Reader's Model Tree. For more information, see 3D Property Publishing. What’s the difference between a Fixed Print Definition and a Variable Print Definition? With the release of Microstation SS3, (8.11.9.292 or later), we now offer a way to import/export print styles from on DGN library or DGN file to another. This was added to aid users who have created print styles in DGN files thus finding their print styles trapped and usable only via that particular DGN file. Now you can move these print styles to whatever DGN file or DGNLIB file you need. How can I create a 3D PDF when printing with Property Publishing? With the release of MicroStation V8i SS3 you can publish non-graphical business items to a 3D PDF document. These business items appear as objects in Adobe Reader’s Model Tree. By default, business items are not included in the published 3D PDF document. You must take additional steps to include the business items. 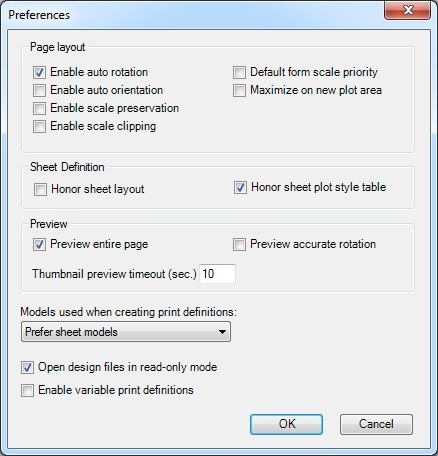 To include business items in a 3D PDF document use the 3D Plotting Options dialog. With the release of MicroStation SELECTseries 3, the Print dialog and Print Organizer interfaces now support using design scripts for print resymbolization. Design scripts were previously used in InterPlot in the IPLOT dialog and InterPlot Organizer interfaces. Placing needful information in the border area of each of your plots can prove to be very useful. The name of the design file and/or the current date/time your plots are submitted can be printed on each plot. You can modify various output settings for existing Print Definitions that already exist in a Print Set. For example, if a Print Definition was created using 8.5” x 11” as the Paper Size and you now want your output to be 11” x 17”, double-click on the Paper Size value for that Print Definition in the Print Set and select the new value from the drop-down list provided. What is the difference in the “Raster Quality Factor” setting and the “Rasterized Quality Factor” setting? The Raster Quality Factor and the Rasterized Quality Factor settings are found in the PDF.pltcfg, Printer.pltcfg and the Pscript.pltcfg print driver configuration files. In the Hpglrtl.pltcfg printer driver configuration file, the Raster Quality Factor setting is called Raster DPI and the Rasterized Quality Factor is called Rasterized DPI. In MicroStation V8i (SELECTseries 1), Bentley added the capability of creating a Georeferenced PDF and a PDF that can be measured. Print Organizer provides a seamless upgrade for Batch Print users. Legacy data created for the Batch Print utility such job set files are supported in Print Organizer. When comparing PDF files with different resolutions, the line widths in the resulting PDF files can vary. The following explains why this occurs. A 'point' is 1/72 of an inch. This is the common unit of measurement in PostScript and PDF.